Showing items in category Sudan, sorted by newest listed first. SUDAN - 1929 2m-20m 'Postage Dues' on local 'Cook's Nile Service' cover used at WADI HALFA. 1929 (JAN.11.) 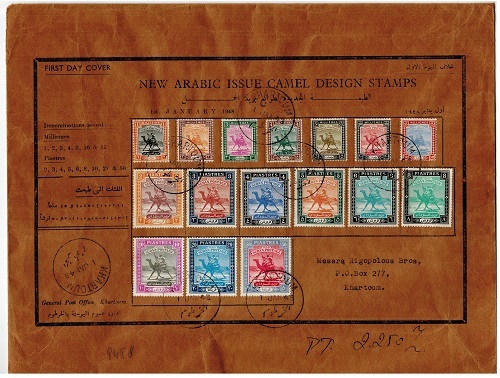 locally addressed 'philatelic inspired' cover bearing the 2m-20m postage due series (SG D5-D8) tied by WADI HALFA cds's. Unusual. 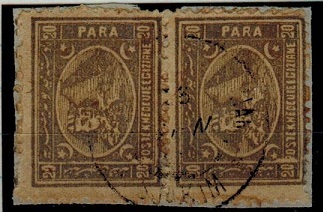 SUDAN - 1874 2pi grey Egypt adhesive pair used at SUAKIM. EGYPT USED IN - 1874 2pi grey Egyptian adhesive vertical pair cancelled by near complete light POSTE KHEDEUIE EGIZIANE/SUAKIM cds. Scarce use. SUDAN - 1872 2pi yellow Egypt adhesive used at MASSAWA. EGYPT USED IN - 1872 2pi yellow Egyptian adhesive tied by near complete POSTE KHEDEUIE EGIZIME/MASSAWA cds. 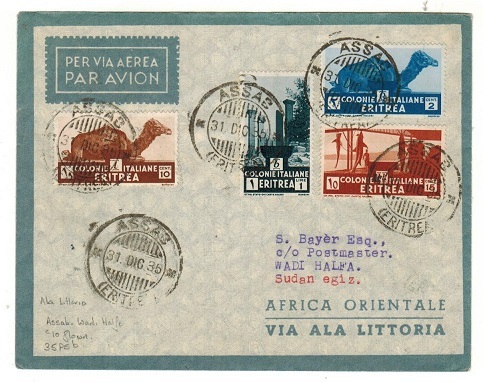 (Ex Ethiopia) Scarce use. SUDAN - 1902 5m carmine PSE to UK cancelled by 'Retta' cancel. H&G 5. 1902 5m carmine on cream postal stationery envelope addressed to UK cancelled by scarce 'retta' killer strike (Proud type K1) with EL-OBEID b/s dated 17.FEB.20. H&G 5. SUDAN - 1921 15m ultramarine RPSE uprated to UK used at WAD MEDANI. H&G 4. 1921 15m Ultramarine on white registered postal stationery envelope (size G) addressed to UK bearing additional 2p (SG 44) tied by WAD MEDANI cds dated 18.APR.39. H&G 4. 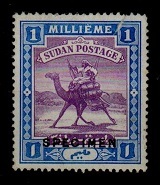 SUDAN - 1921 5m brown PSE uprated to Cape Town and used at MALAKAL. H&G 10a. 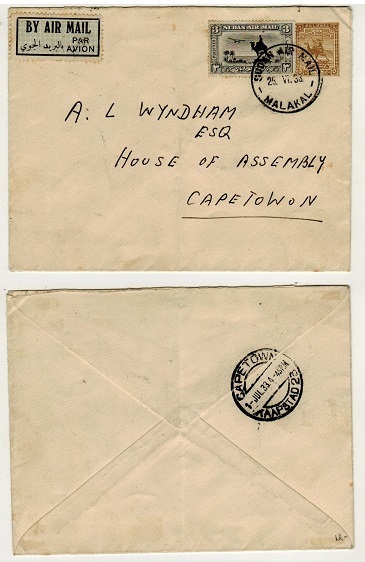 1921 5m brown on cream postal stationery envelope (vertical fold) addressed to Cape Town and bearing additional 3p 'air' adhesive tied SUDAN AIR MAIL/MALAKAL and dated 25.VI.33. H&G 10a. SUDAN - 1927-30 2m, 4m and 10m 'Postage Dues' fine mint blocks of four. SG D9-11. 1927-30 2m, 4m and 10m 'Postage Dues' on chalky paper in fine mint blocks of four. SG D9-11. SUDAN - 1897 FOURNIER proof strikes of the SOUDAN and OSGS overprint. 1897 two FOURNIER strikes of the 'Soudan' h/s and 'O.S.G.S.' handstamps printed in black on cream card taken from the Fournier forgery handbook. SUDAN - 1921 15m blue RPSE unused. H&G 5. 1921 15m ultramarine on cream registered postal stationery envelope with type B space in fine unused condition. H&G 5. SUDAN - 1908 1p blue RPSE unused. H&G 2. 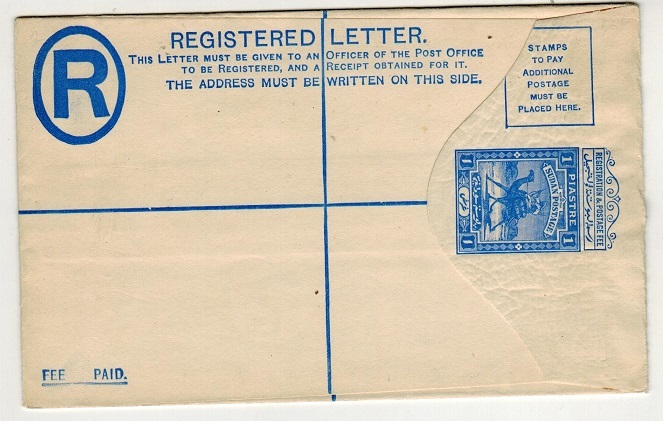 1908 1p ultramarine on cream registered postal stationery envelope with type B space in fine unused condition. H&G 2. 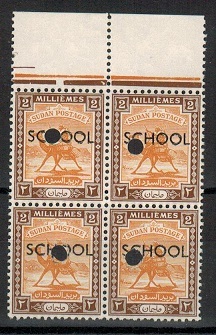 SUDAN - 1921 2m orange PSE unused. H&G 9. 1921 2m orange on cream laid paper postal stationery envelope with tongue flap in fine unused condition. H&G 9. 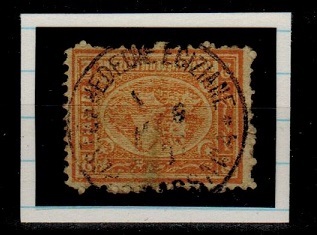 SUDAN - 1902 5m carmine PSE to Egypt used at TEWFEKIA.SUDAN. H&G 5. 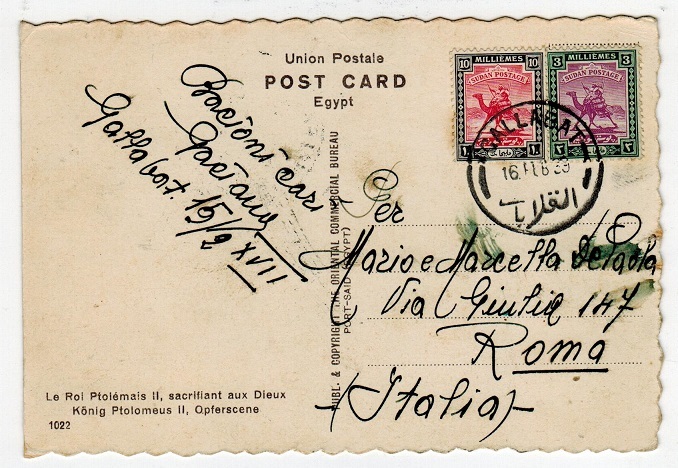 1902 5m carmine on cream postal stationery envelope addressed to Egypt cancelled by TEWFEKIA.SUDAN cds. Proud type D5. H&G 5. SUDAN - 1940 4 1/2p overprint PROOF (SG type 19) block of four on ungummed paper. 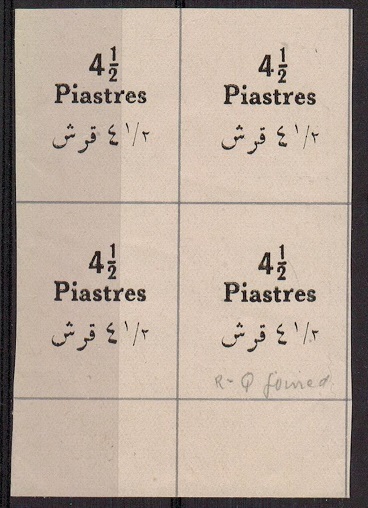 1940-41 '4 1/2 Piastres' overprint PROOF strike (SG type 19) in a fine block of four each struck on squared imperforate cream ungummed paper. (4 proofs). Fine and scarce item as per SG 80. SUDAN - 1939 inward 'SUDAN/17/CENSORSHIP' cover from Egypt. 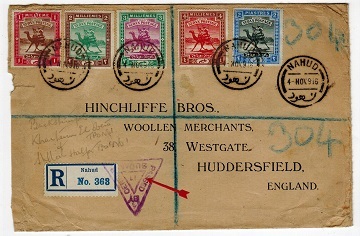 1939 inward registered cover from Egypt with REGISTERED SHELLAL-HALFA T.P.O. b/s dated. 26.SP.39 and with KHARTOUM NORTH arrival cds dated 27.SEP.39. Green SUDAN/17/CENSORSHIP label attached to top (Little type 1) tied by violet triangular PASSED/CENSORSHIP/17/SUDAN h/s. A nice early censor cover. SUDAN - 1941 2p rate 'SUDAN/1/CENSORSHIP' cover to USA. 1941 (MR.6.) 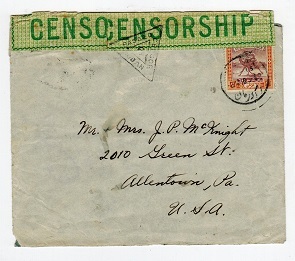 cover addressed to USA (few odd edge tears at top) bearing 2p adhesive tied by MALAKAL cds with green SUDAN/1/CENSORSHIP label at left tied on the front by PASSED CENSOR/18/SUDAN h/s. 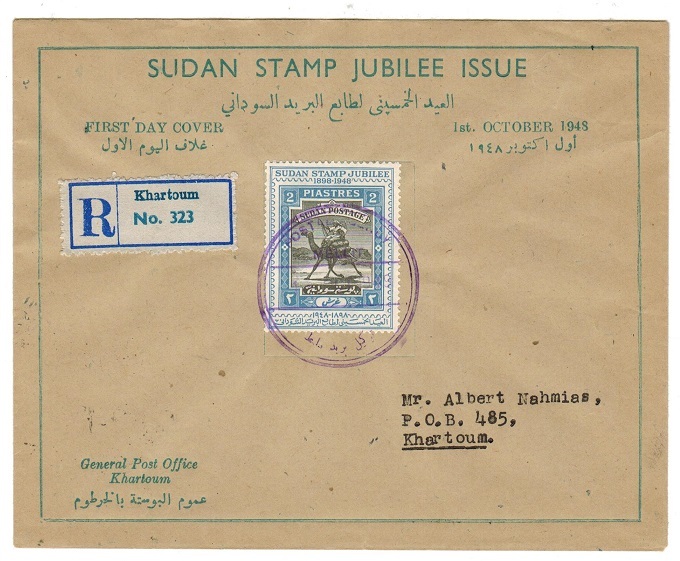 SUDAN - 1941 5m rate 'SUDAN/2/CENSORSHIP' cover to Egypt. 1941 (FEB.11.) 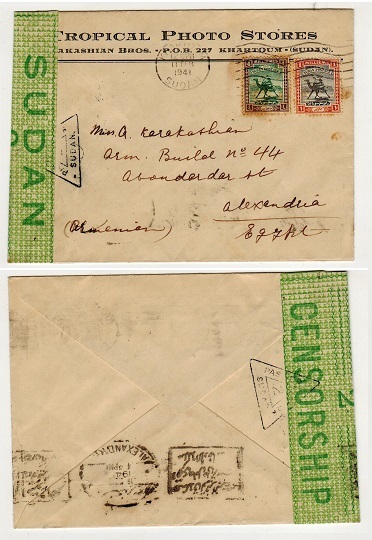 commercial cover addressed to Egypt bearing 1m and 4m adhesives tied by KHARTOUM/ SUDAN roller strike with green SUDAN/2/CENSORSHIP label (Little type II) at left tied by black triangular PASSED/CENSOR/2/SUDAN h/s. 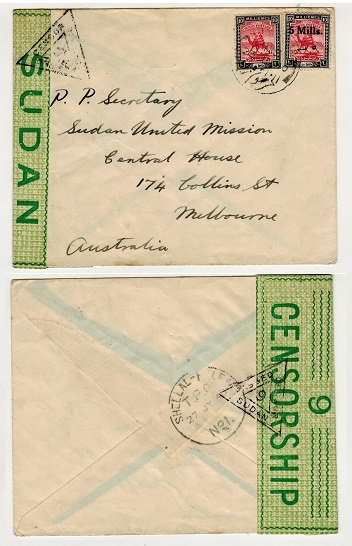 SUDAN - 1940 15m rate 'SUDAN/9/CENSORSHIP' cover to Australia. 1940 (23.JUL.) 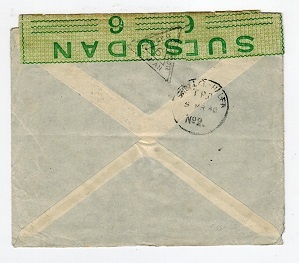 cover addressed to Australia bearing 10m and 5m on 10m surcharge tied by KHARTOUM/MAILS cds with green SUDAN/9/CENSORSHIP label (Little type II) at left tied by black triangular PASSED/CENSOR/9/SUDAN h/s. SUDAN - 1880 (circa) red on cream INTERPOSTAL SEAL for SAWAKIN. 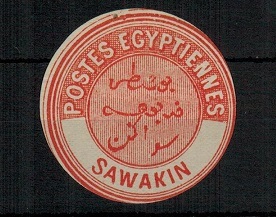 1880 (circa) red on cream INTERPOSTAL SEAL for SAWAKIN. SUDAN - 1932 15m rate cover to UK used at KADUGLI. 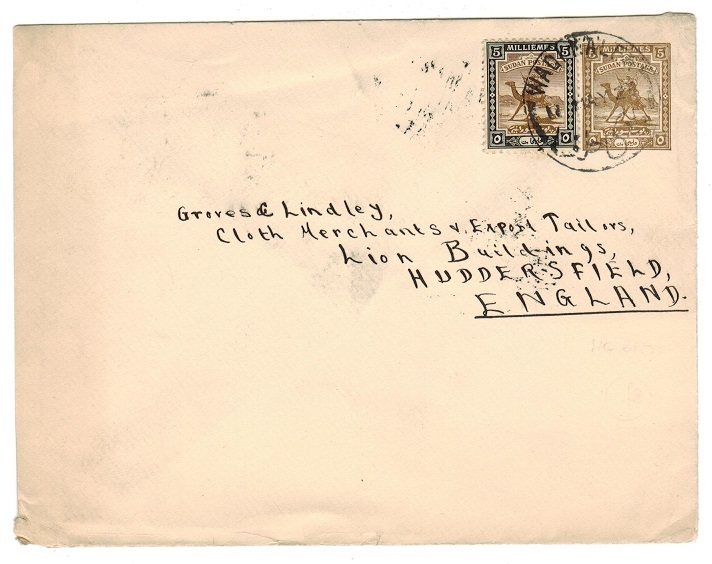 1932 (OC.31) cover to UK bearing 5m strip of three (SG 41) tied by KADUGLI cds. (Stagg type 106-1). SUDAN - 1931 10m rate cover to UK used HALFA-KHARTOUM/TPO. 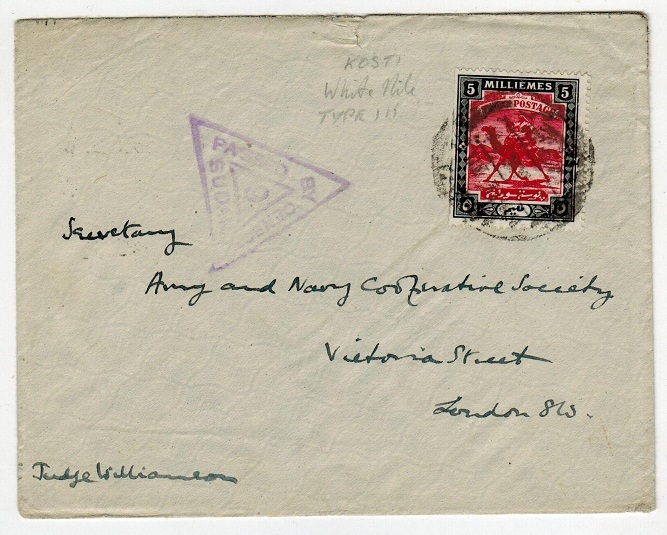 1931 (NO.4) cover to UK bearing 5m pair tied by HALFA-KHARTOUM/T.P.O. cds No.2 (Stagg 226) with SHELLAL-HALFA TPO b/s. SUDAN - 1901 5m rate postcard use to Germany used at ZEIDAB. 1901 (17.VI.) 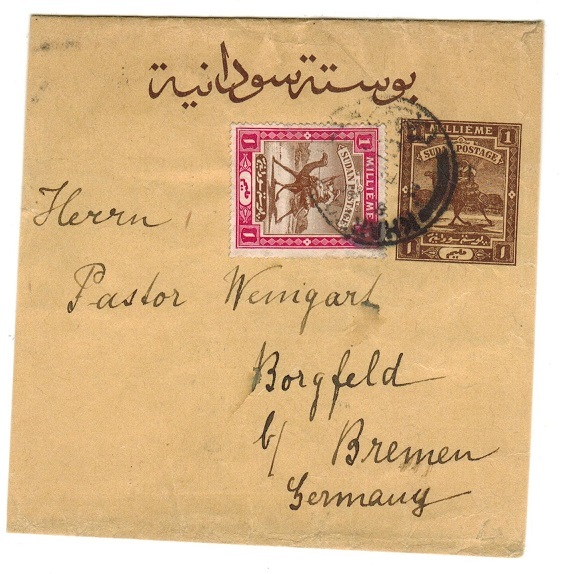 use of picture postcard addressed to Germany depicting 'type bedouin' bearing 5m adhesive tied ZEIDAB. SUDAN - 1902 4m rate postcard use to UK used at TEWFEKIA SUDAN. 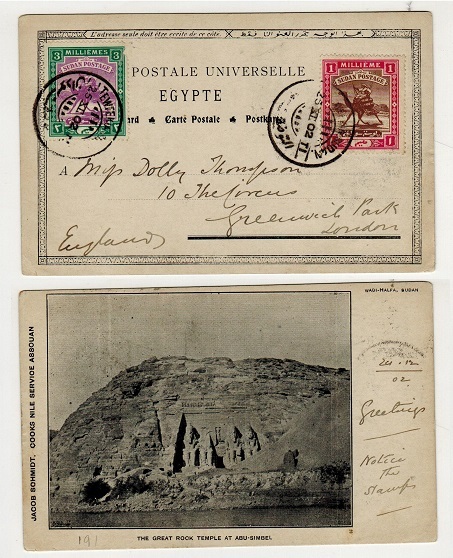 1902 (25.XI) use of picture postccard addressed to UK depicting 'The Great Rock Temple at Abu Simbel' bearing 1m & 3m adhesives tied by TEWFEKIA SUDAN cds. SUDAN - 1905 4m rate postcard use to USA used at HALFA-HALFAYA/T.P. 1905 use of black & white picture postcard addressed to USA depicting 'Khartoum Street' bearing two 2m adhesives (SG 19) tied by HALFA-HALFAYA/T.P. (travelling post office) cancel. (Stagg type 223). SUDAN - 1907 4m rate postcard use to UK used at ABU HAMED. 1907 (7.XI.) 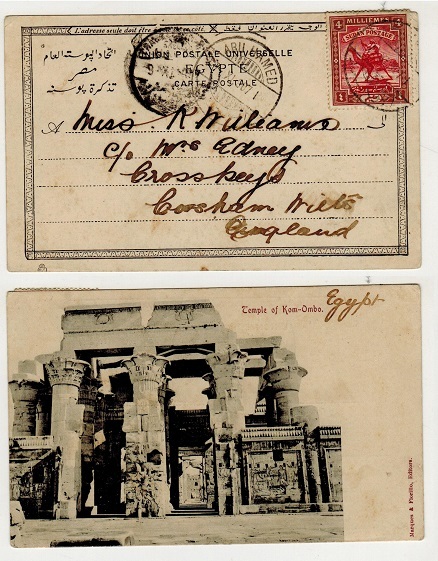 use of picture postcard addressed to UK depicting 'Temple Of Kom-Ombo' and bearing 4m adhesive tied by ABU HAMED (bridge) type cancel. SUDAN - 1913 4m rate postcard use to UK used at HALFA/KHARTOUM/TPO No.2. 1913 (JAN.5.) use of picture postcard addressed to UK depicting 'Korosko, Shellal-Halfa Reach' bearing 4m adhesive tied by HALFA-KHARTOUM/TPO No.2 cds. 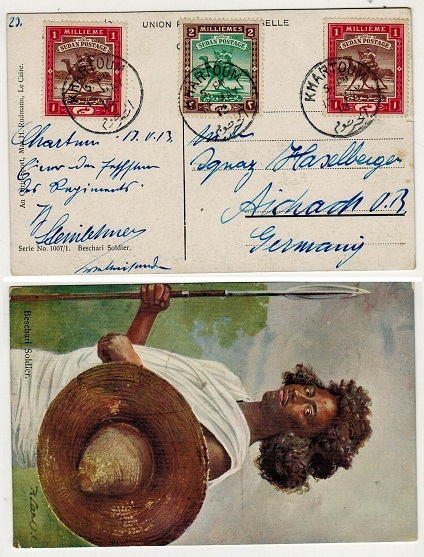 SUDAN - 1913 4m rate postcard use to Germany used at KHARTOUM. 1913 (MAY.13.) use of picture postcard addressed to Germany depicting 'Beschari Soldier' bearing 1m (x2) and 2m adhesives tied KHARTOUM. 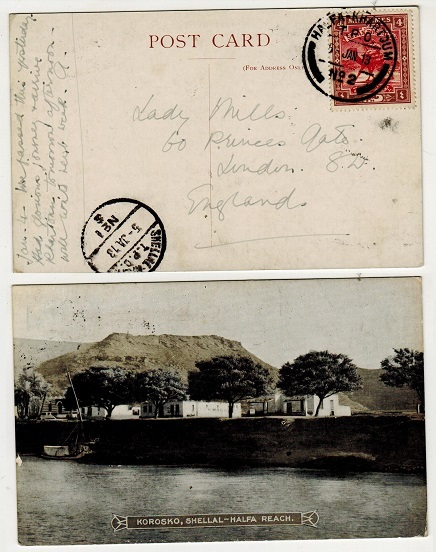 SUDAN - 1918 3m rate postcard use to Belgium used at RAJAF. 1918 (JAN.1.) 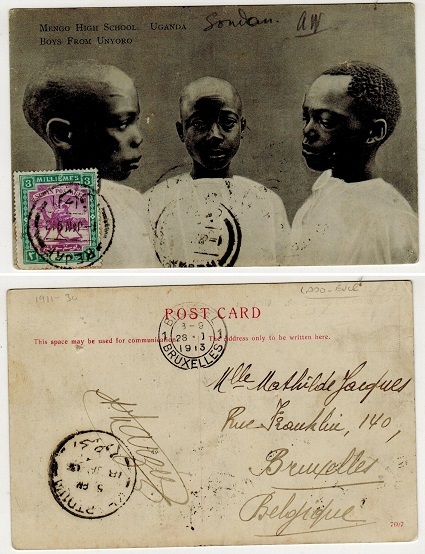 use of picture postcard addressed to Belgium depicting 'Mengo High School Boys from Unyoro, Uganda' bearing Sudan 3mils adhesive tied to picture side by REJAF cds with KHARTOUM transit and BRUSSEL arrival. 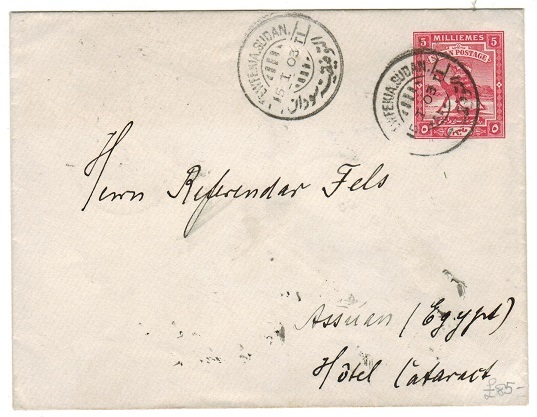 SUDAN - 1898 multi-franked cover to Egypt used at HALFA. 1898 (4.II.) 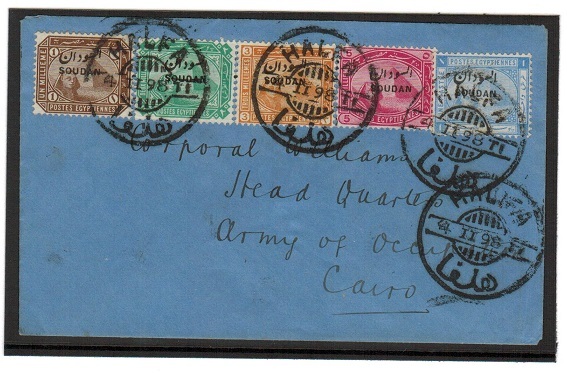 cover addressed to a Corporal stationed at Head Quarters of Army Occupation in Egypt bearing 1m,2m,3m,5m and 1p adhesives (SG 1-6) tied by HAIFA cds's and with CARIO b/s. SUDAN - 1897 5m carmine PSE to Egypt used at EL OBEID. H&G 3. 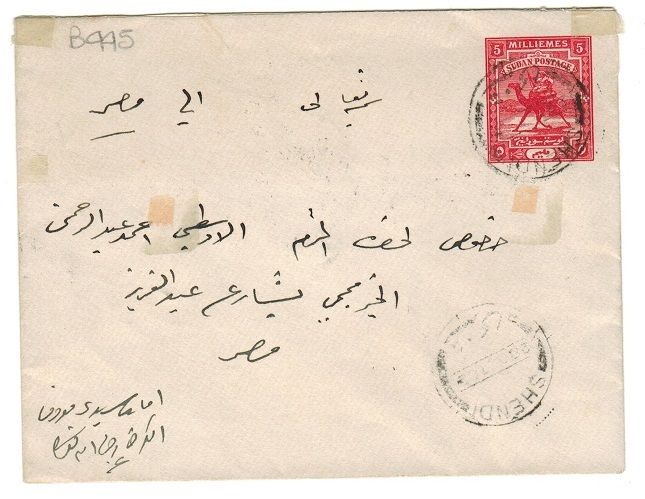 1897 5m carmine on cream postal stationery envelope addressed to Cairo & cancelled by EL OBEID cds dated 12.VIII.02. H&G 3. 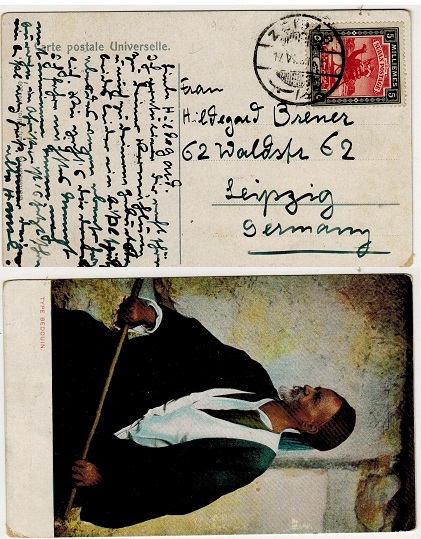 SUDAN - 1897 5m uprated stationery letter envelope to Germany used at SAWAKIN. H&G 3. 1897 5m carmine on cream (flap on reverse) stationery envelope addressed to Germany bearing additional 5m adhesive and tied by SAWAKIM cds dated 28.NO.00. The envelope is overall toned. H&G 3. 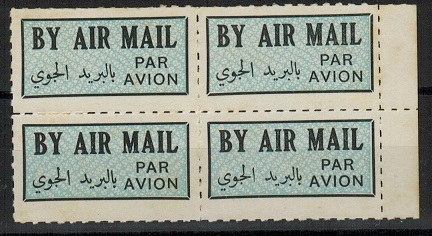 SUDAN - 1930 (circa) air mail label block of four. 1930 Circa black on blue on white BY AIR MAIL/PAR AVION label marginal block of four on gummed paper as issued and with the 'rouletted' perfs. 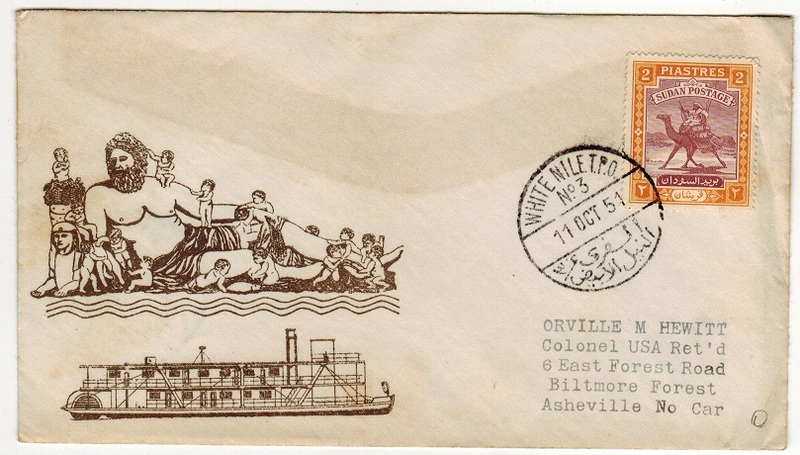 SUDAN - 1951 Illustrated cover to USA used at WHITE NILE TPO/No.3. 1951 (OCT.11) Illustrated cover to USA bearing 2p (SG 103) tied by superb WHITE NILE. T.P.O./No.3 cds (Stagg 272). SUDAN - 1935 5m IMPERFORATE COLOUR TRIAL in brown. 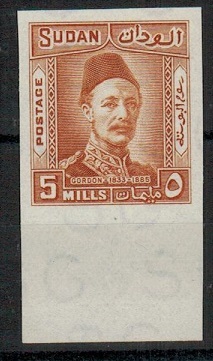 1935 5m 'Gordon' IMPERFORATE COLOUR TRIAL with large bottom margin printed in brown on ungummed 'SG' watermarked paper. (SG type 12). Scarce. 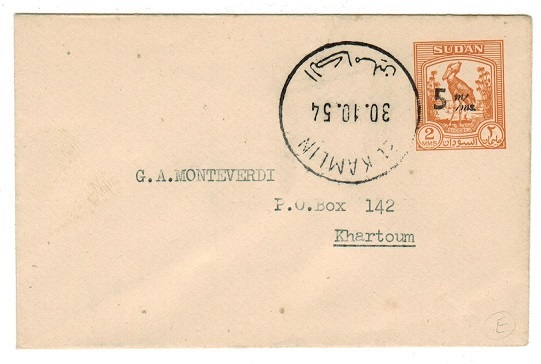 SUDAN - 1915 censored registered cover to UK used at ATBARA. 1915 (13.NO.) use of blank type postcard addressed to USA bearing 4m adhesive tied by ATBARA cds with violet triangular PASSED/BY/CENSOR/9/SUDAN h/s at left. SUDAN - 1906 5m on 5p ultramarine PSE censored to Egypt and struck by 'retta' cancel. H&G 7. 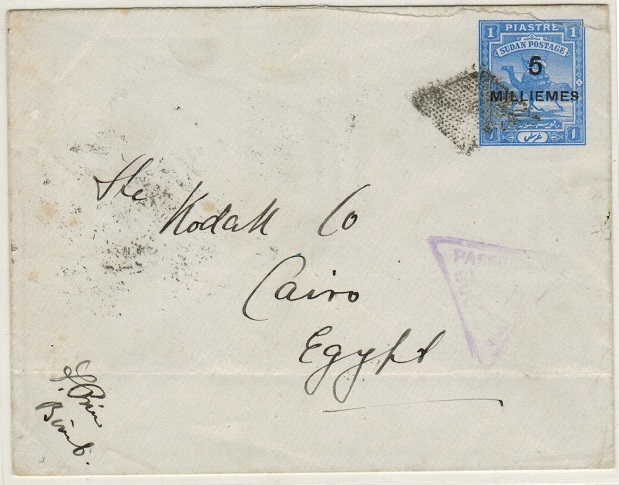 1906 5m black on 5p ultramarine on white postal stationery envelope addressed to Egypt cancelled by scarce 'Retta' cancel (Stagg type 406) with violet triangular PASSED BY CENSOR/ SUDAN h/s. (Faint & with horizontal fold at bottom). Shellal-Halfa/TPO/No.2, El-Obeid & Khartoum transit b/s's of May 1917. A very scarce piece of stationery. H&G 7. SUDAN - 1902 5m carmine PSE used locally from SHENDI. H&G 5. 1902 5m carmine on pale bluish cream postal stationery envelope addressed in local script and cancelled by SHENDI cds dated 28.OCT.02. H&G 5. 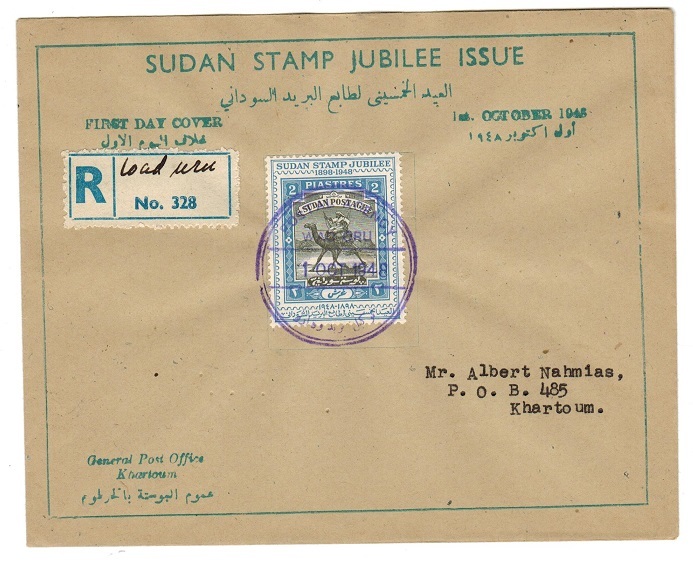 SUDAN - 1952 POSTAGE PAID h/s on cover to UK used at KHARTOUM. 1952 (JAN.9.) 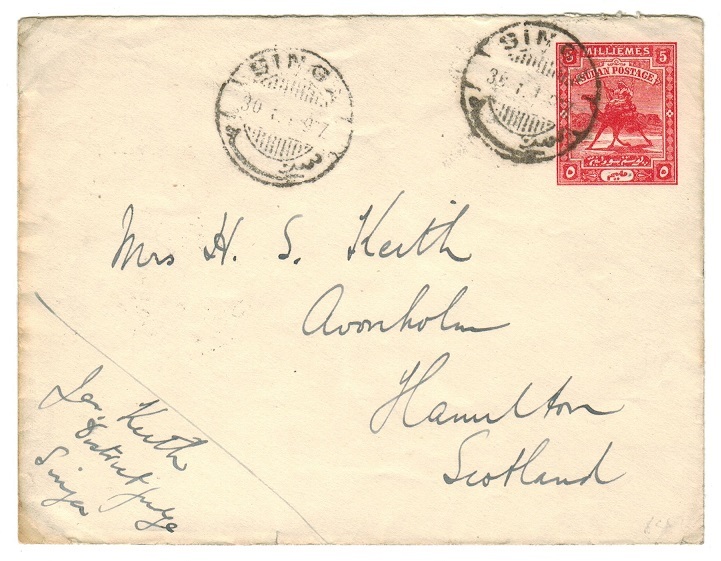 stampless cover addressed to UK struck by magenta boxed POSTAGE/PAID h/s and cancelled KHARTOUM. SUDAN - 1953 5m black on 2m PSE used locally from EL KAMLIN. H&G 15. 1953 5m black on 2m orange-brown on cream postal stationery envelope addressed locally to Khartoum and cancelled by EL KAMLIN cds dated 30.10.54. H&G 15. SUDAN - 1964 4p aerogramme to USA used at KHARTOUM. H&G 4. 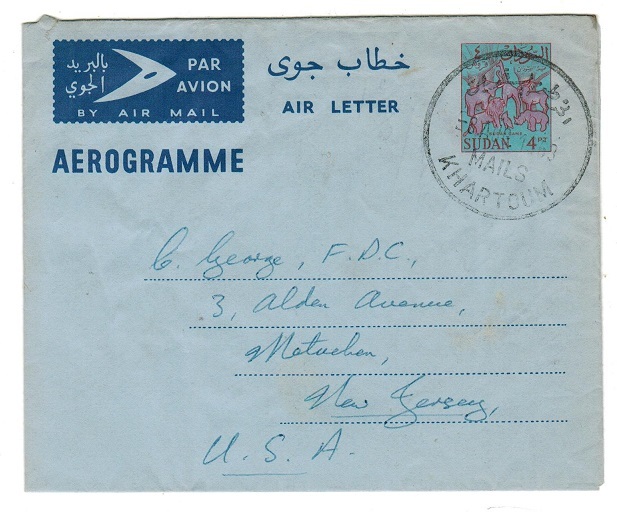 1964 4p pinkish brown on light blue postal stationery aerogramme addressed to USA cancelled by KHARTOUM/MAILS cds dated 8.AUG.1968. A scarce genuine use. H&G 4. SUDAN - 1921 2 1/2p RPSE to Greece used at KHARTOUM. H&G 7. 1921 2 1/2p olive brown on cream registered postal stationery envelope addressed to Greece bearing additional 5m adhesive tied by REGISTERED/KHARTOUM cancel 26.NO.23. H&G 7. SUDAN - 1897 1p blue PSE unused. H&G 4. 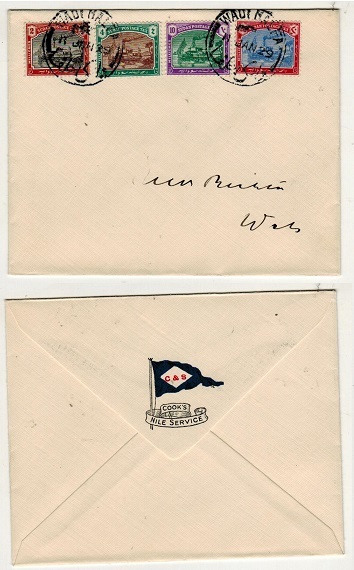 1897 1p blue on bluish white laid paper postal stationery envelope with pointed flap in fine unused condition. H&G 4. 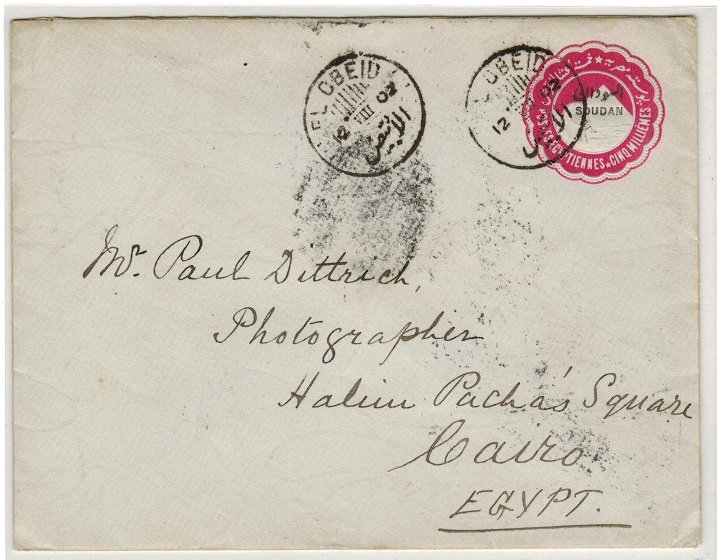 SUDAN - 1897 multi franked cover to Egypt. 1897 (13.X.) cover addressed to Egypt in Arabic bearing 1m,3m,5m amd 1p adhesives (SG 1,4,5+6) tied by HALFA cds's. CAIRO arrival b/s. 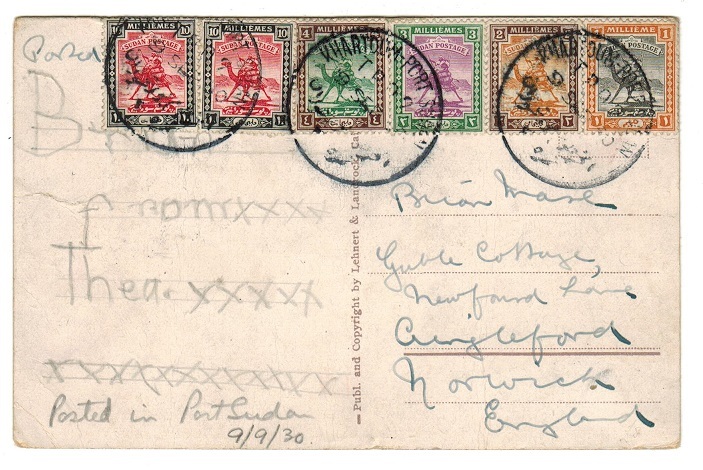 Scarce stamps on cover with the 5m showing an interesting MISPLACEMENT OF OVERPRINT TO TOP. 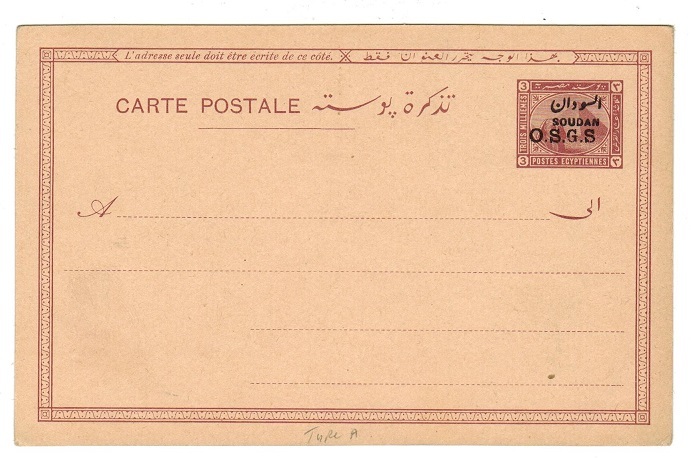 SUDAN (French) - 1924 registered cover to France used at KOULOUBA. 1924 (JUIN.8.) registered cover addressed to France bearing 40c and 45c 'Soudan Francais' overprint issues on front tied by KOULOUBA/SOUDAN FRANCAIS cds's with black on cream registered 'blank' type 'R/No.237' registered label at left handstamped by black s/l BAMAKO-KOULOUUBA handstamp. 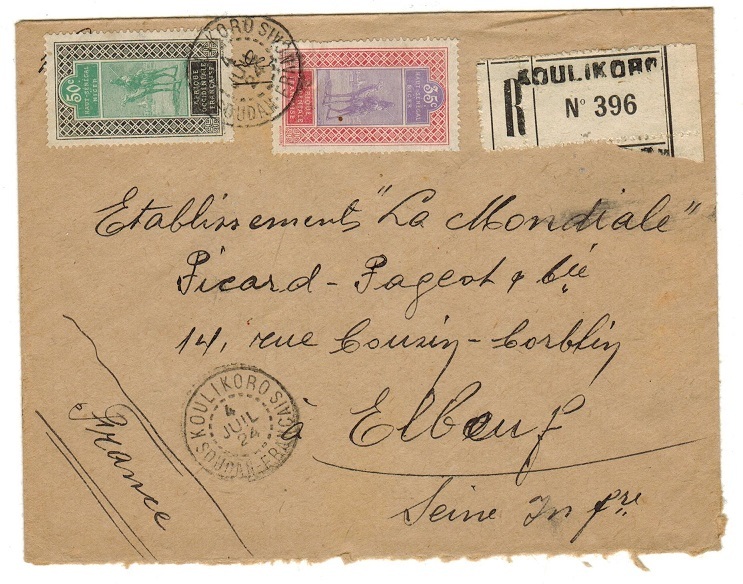 SUDAN (French) - 1924 registered cover to France used at KOULIKORO. 1924 (JUIL.4.) 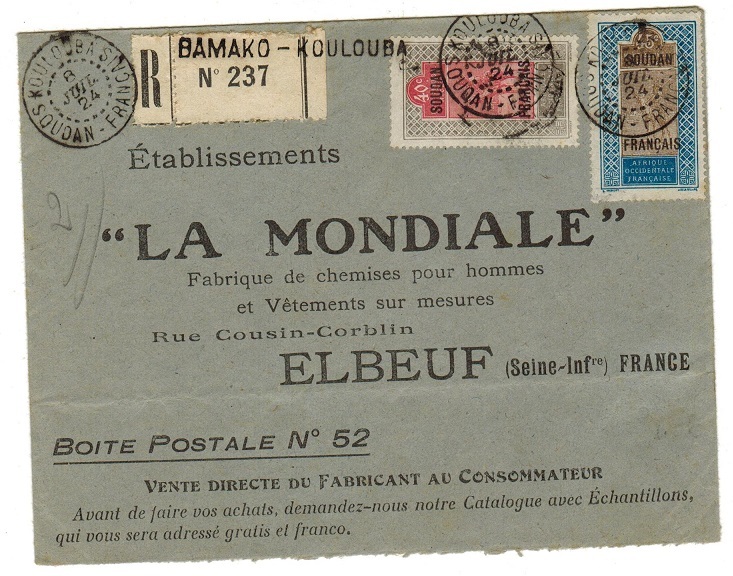 registered cover addressed to France bearing 35c and 45c adhesives tied by KOULIKORA/SOUDAN FRANCIS cds's with black on cream 'R/No.396' registered 'blank' type label at left handstamped KOULIKORO. 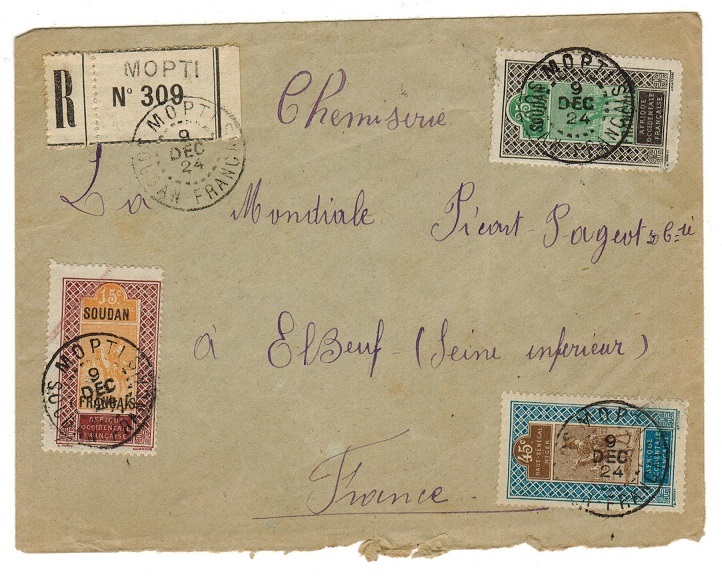 SUDAN (French) - 1924 registered cover to France used at MOPTI. 1924 (DEC.9.) registered cover addressed to France bearing 45c adhesives on front tied in combination with 15c and 25c SOUDAN/FRANCAIS overprint issues by MOPTI/SOUDAN FRANCAIS cds's with black on cream 'R/No.309' registered 'blank' type label at left handstamped MOPTI. 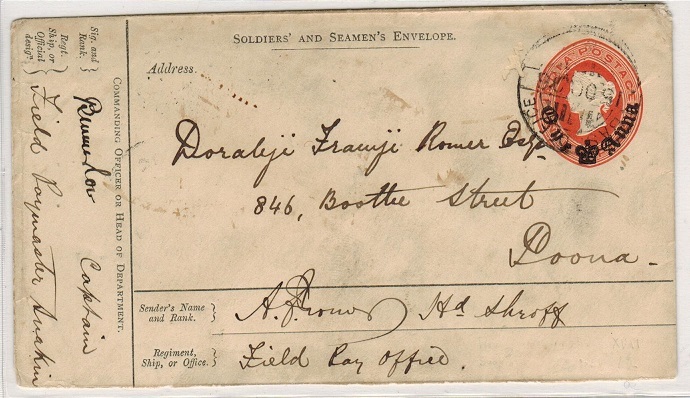 SUDAN - 1895 1a on 9p 'Soldier Seamen' envelope to Poona used at BASE OFFICE/B in Sudan. 1895 1 anna black on 9d red 'Soldiers and Seamens' envelope addressed to Poona cancelled by BASE OFFICE/B canceldated 15.OC.96. (Small repaired worm hole). Endorsed by Captain Burmerlow of the Field Paymaster at Suakin. A scarce use of this stationery by serving soldier stationed in Sudan. SEA POST OFFICE transit b/s and POONA arrival. H&G 2. 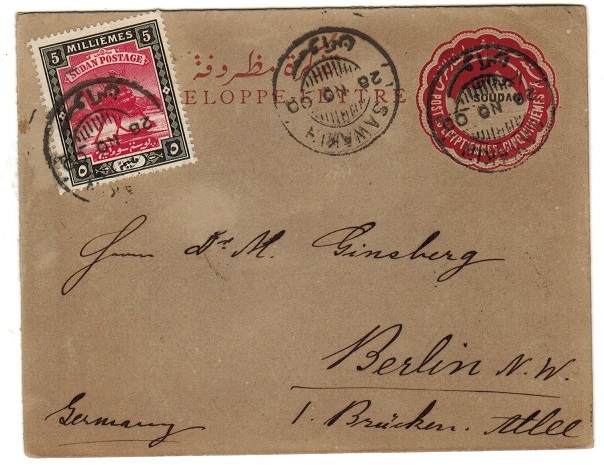 SUDAN - 1908 1m brown postal stationery wrapper uprated to Germany. H&G 3. 1908 1m brown on yellowish postal stationery wrapper addressed to Germany bearing additional 1m adhesive and tied by KHARTOUM cds. H&G 3. SUDAN - 1902 5m PSE to UK used at SINGA. H&G 5. 1902 5m carmine on white postal stationery envelope addressed to UK cancelled by SINGA cds dated JAN.40.17 with scarcer KHARTOUM transit (Proud type D15) backstamp. H&G 5. 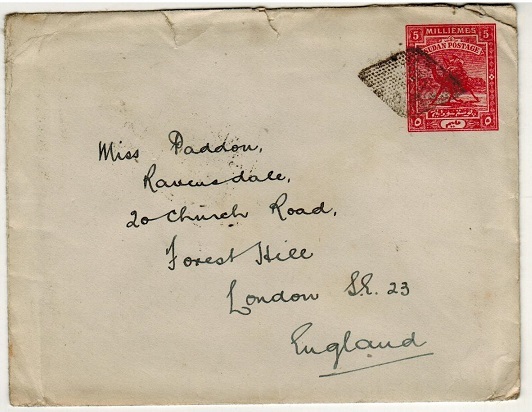 SUDAN - 1916 'PASSED BY CENSOR 9' cover to UK used at KOSTI WHITE NILE. 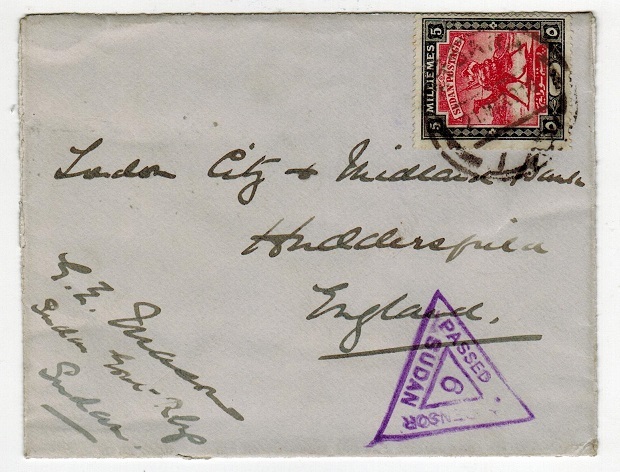 1916 cover to UK bearing 5m (SG23) tied by smudged KOSTI WHITE NILE cds with violet PASSED BY CENSOR-9-SUDAN h/s. Shellal-Halfa/TPO-1 and Khartoum-Elobeid/TPO-1 b/s's dated 21.Ju.16. 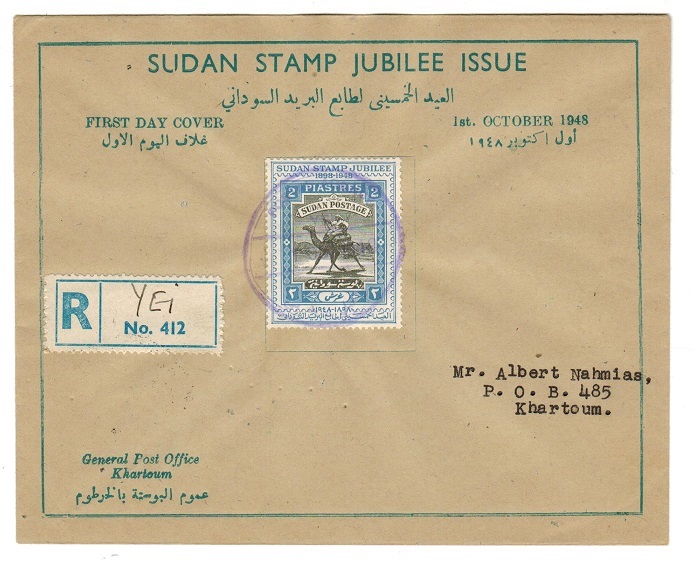 SUDAN - 1916 'PASSED BY CENSOR 6' cover to UK from ATBARA. 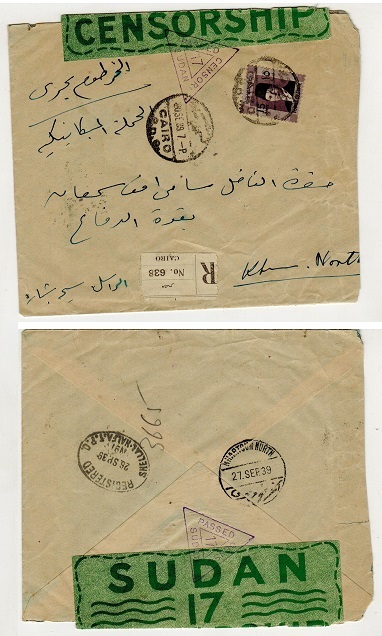 1916 (Mr.21) Military cover to UK bearing 5m (SG13) tied ATBARA with violet PASSED BY CENSOR-6-SUDAN h/s. (Stagg type 375). Shellal Halfa TPO No.2 b/s. SUDAN - 1935 15m rate cover to UK used at PORT SUDAN QUAY. 1935 (NOV.8) 'Bibby Line' envelope addressed to UK bearing 15m (SG43) tied by PORT SUDAN QUAY cds (Stagg type 109-1). Various b/s's. 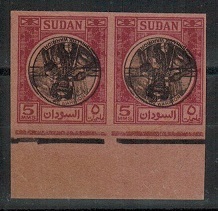 SUDAN - 1921 5m brown PSE uprated to UK and used at WADI HALFA. H&G 10. 1921 5m brown on cream postal stationery envelope addressed to UK bearing additional 5m adhesive tied by WADI HALFA cds dated 11.MAY.27 with SHELLAL-HALFA/TPO/No.1 transit b/s. H&G 10. SUDAN - 1930 postcard to UK used at KHARTOUM-PORT SUDAN TPO.2. 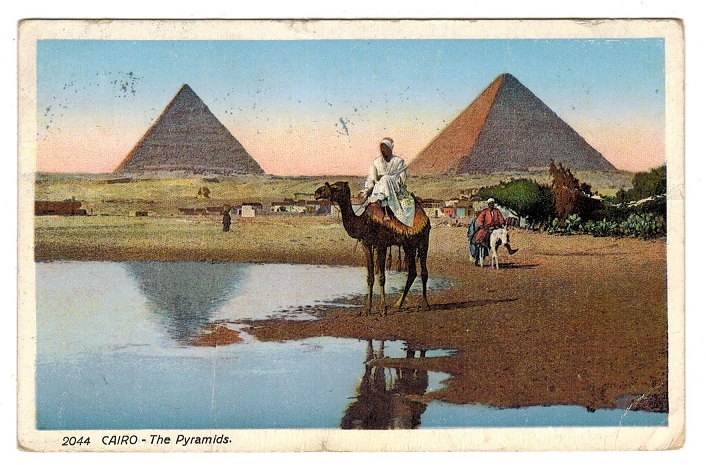 1903 use of coloured picture postcard depicting Cairo Pyramids addressed to UK bearing 1m, 2m, 3m, 4m & 10m pair (SG37-42) tied by various KHARTOUM-PORT SUDAN/T.P.O.2 cds's dated 9.SEP.30. (Stagg type 249). SUDAN - 1908 1m brown unused postal stationery wrapper. H&G 3. 1908 1m brown on yellowish buff postal stationery wrapper in fine unused condition. H&G 3. SUDAN - 1908 2m green unused postal stationery wrapper. H&G 2. 1908 2m green on buff postal stationery wrapper in fine unused condition. H&G 2. SUDAN - 1906 3m 'O.S.G.S.' postal stationery postcard unused. H&G 1. 1906 3m violet on cream postal stationery postcard in fine unused condition overprinted O.S.G.S. in black with (13mm overprint type) and showing the variety MISSING STOP AFTER S in O.S.G.S. H&G 1. SUDAN - 1952 illustrated cover to USA used at SHELLAL-HALFA/TPO No.2. 1952 (12.11) Illustrated cover to USA bearing 5m (SG 127) tied by very fine SHELLAL-HALFA/ T.P.O.No.2 cds (Stagg 215). 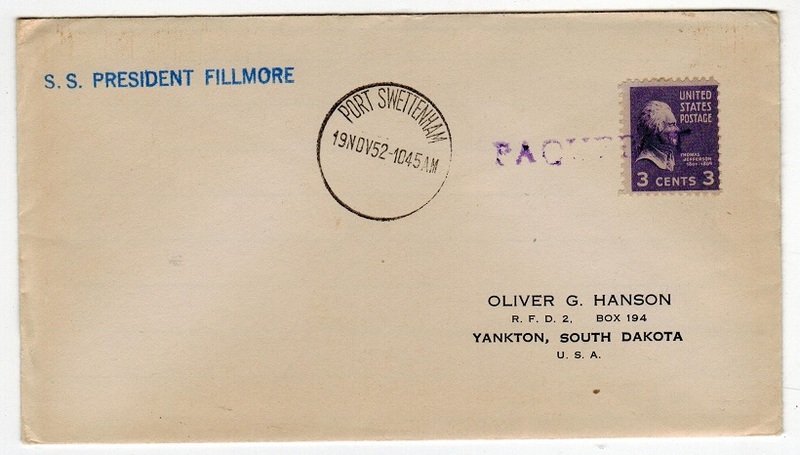 SUDAN -1952 PAQUEBOT cover to USA used on the S.S.PRESIDENT FILLMORE from PORT SWETTENHAM. 1952 (NOV.19) cover to USA bearing US 3c tied by violet PAQUEBOT h/s with PORT SWETTENHAM cds at left and blue maritime S.S.PRESIDENT FILLMORE strike. 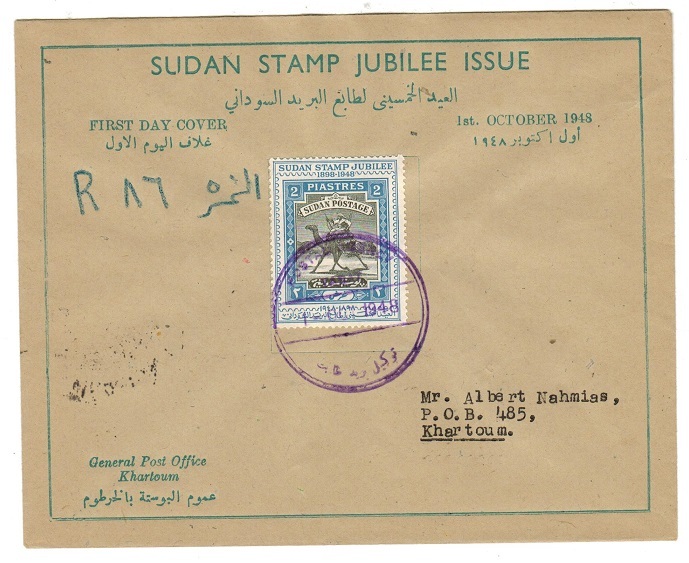 SUDAN - 1948 cover to UK used at HASSA HEISSA. 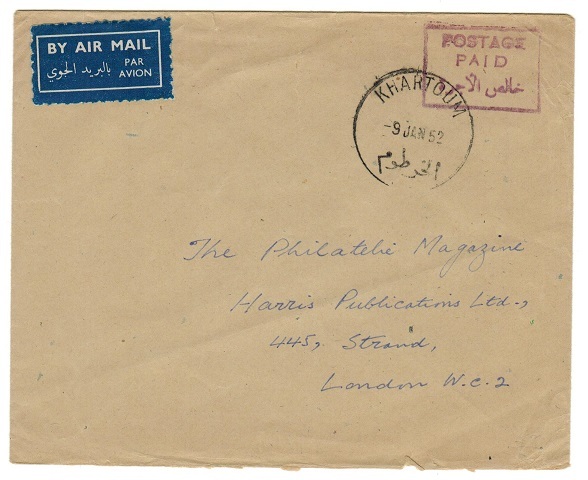 1948 (FE.16) cover to UK bearing 3p adhesive tied by HASSA HEISSA cds. 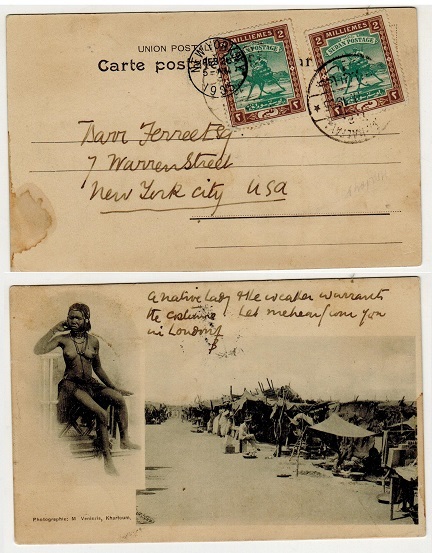 SUDAN - 1939 13m rate use of postcard to Italy used at GALLABAT. 1939 (FEB.16.) use of picture postcard addressed to Italy bearing 3m and 10m adhesives tied by GALLABAT cds (Proud type D4). This town just on the Ethiopian border was held under Italian rule from July of the following year. SUDAN - 1933 15m rate cover to UK used at BARAKAT. 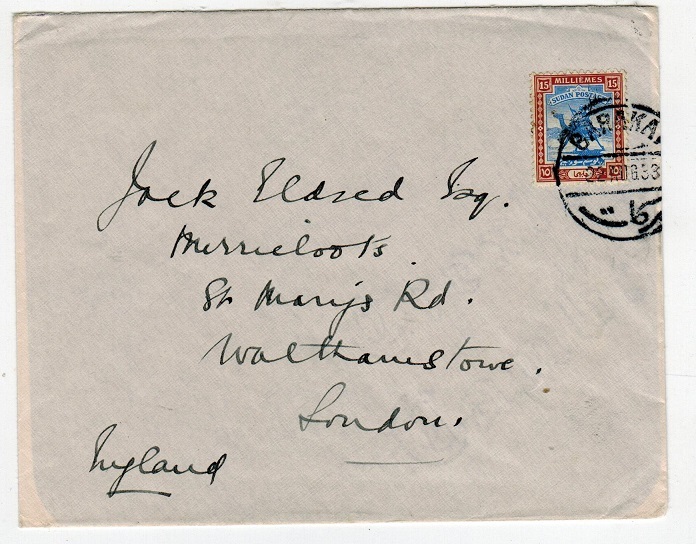 1933 (AU.22) cover to UK bearing 15m adhesive tied by BARAKAT cds. 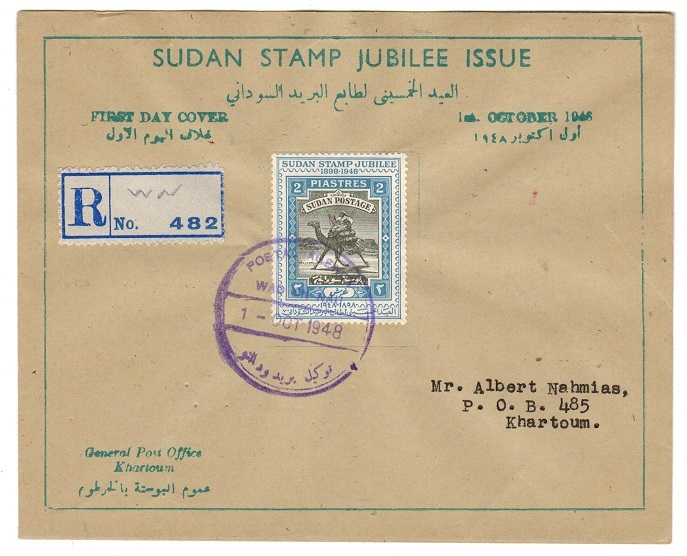 SUDAN - 1948 registered POSTAL AGENCY/EL OBEID cover. 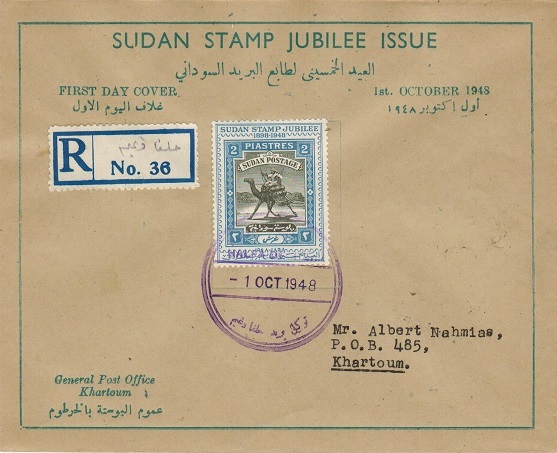 1948 (OCT.1) first day use of the 2p (SG112) adhesive on illustrated `Sudan Stamp Jubilee' cover reg'd locally & cancelled by light violet POSTAL AGENCY/EL OBEID cds. SUDAN - 1948 registered POSTAL AGENCY/GEIGAR cover. 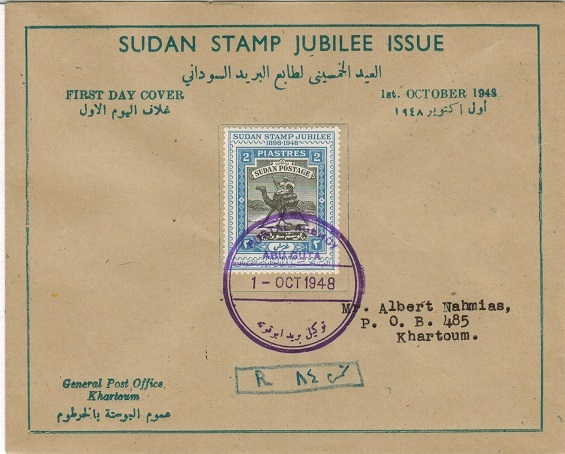 1948 (OCT.1) first day use of the 2p (SG112) adhesive on illustrated `Sudan Stamp Jubilee' cover reg'd locally & cancelled by scarce violet POSTAL AGENCY/GEIGAR cds. SUDAN - 1948 registered POSTAL AGENCY/YEI cover. 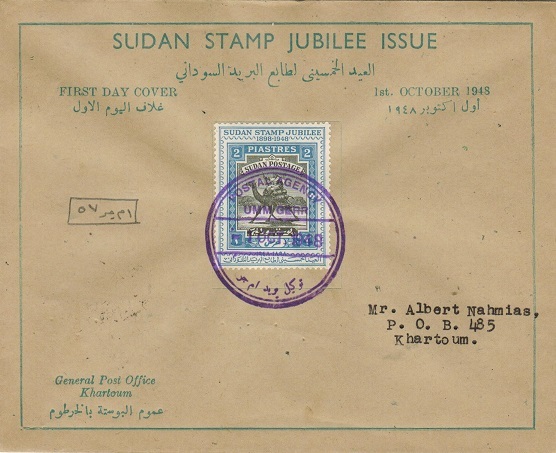 1948 (OCT.1) first day use of the 2p (SG112) adhesive on illustrated `Sudan Stamp Jubilee' cover reg'd locally & cancelled by scarce violet POSTAL AGENCY/YEI cds. SUDAN - 1948 registered POSTAL AGENCY/TANGASI SUK cover. 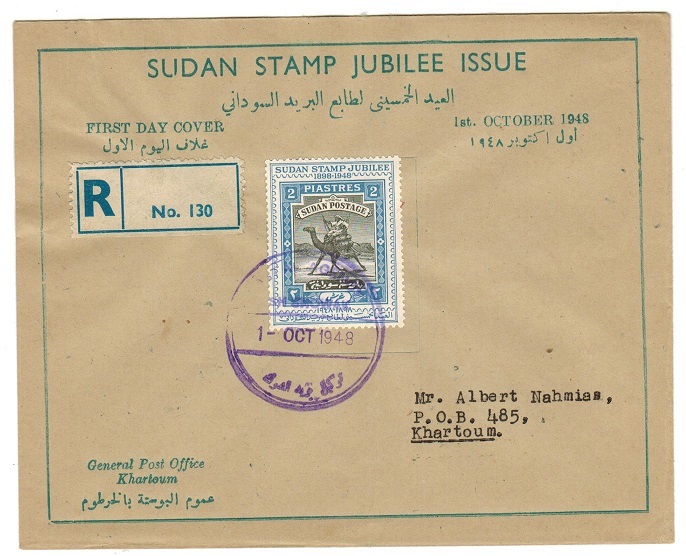 1948 (OCT.1) first day use of the 2p (SG112) adhesive on illustrated `Sudan Stamp Jubilee' cover reg'd locally & cancelled by scarce violet POSTAL AGENCY/TABAT cds. 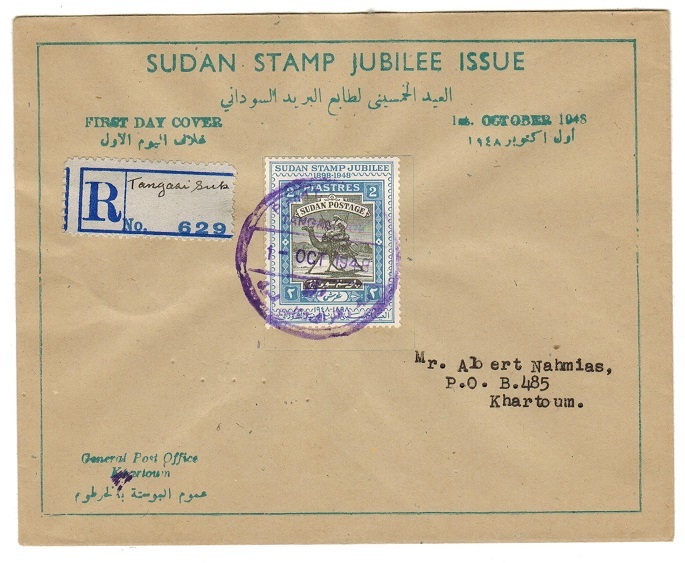 1948 (OCT.1) first day use of the 2p (SG112) adhesive on illustrated `Sudan Stamp Jubilee' cover reg'd locally & cancelled by scarce violet POSTAL AGENCY/TANGASI SUK cds. SUDAN - 1948 registered POSTAL AGENCY/ESH SHOWAK cover. 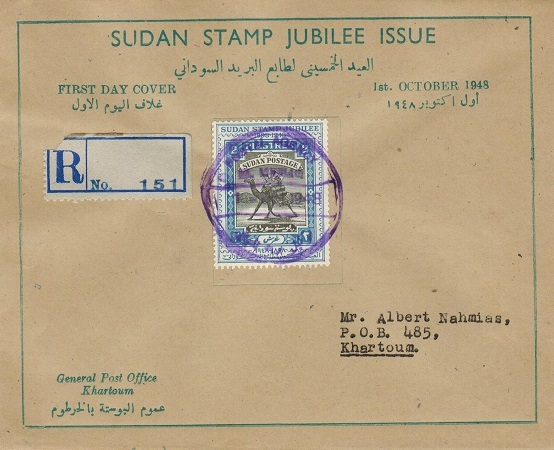 1948 (OCT.1) first day use of the 2p (SG112) adhesive on illustrated `Sudan Stamp Jubilee' cover reg'd locally & cancelled by scarce violet POSTAL AGENCY/ESH SHOWAK cds. Scarce strike. SUDAN - 1948 registered POSTAL AGENCY/WAD ORU cover. 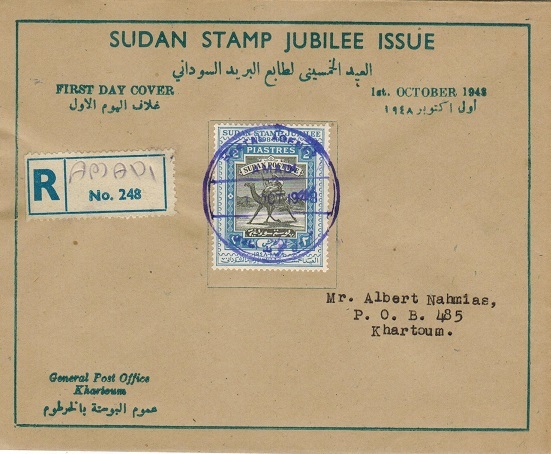 1948 (OCT.1) first day use of the 2p (SG112) adhesive on illustrated `Sudan Stamp Jubilee' cover reg'd locally & cancelled by scarce violet POSTAL AGENCY/WAD ORU cds. 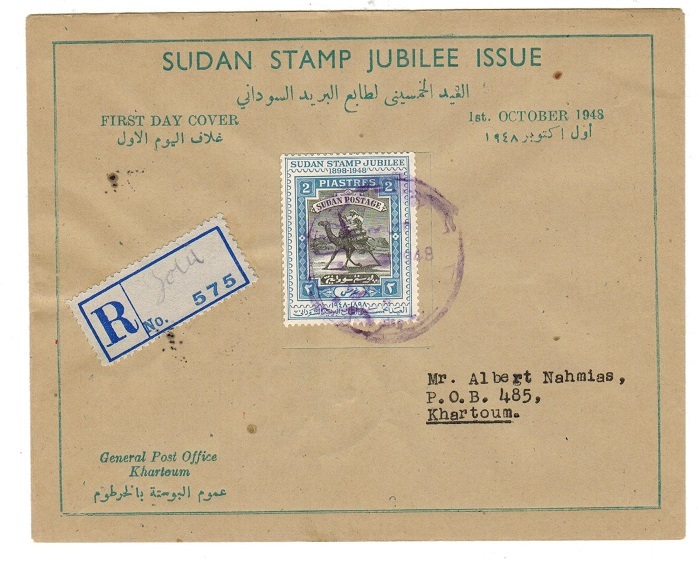 SUDAN - 1948 registered POSTAL AGENCY/WAD EL NAU cover. 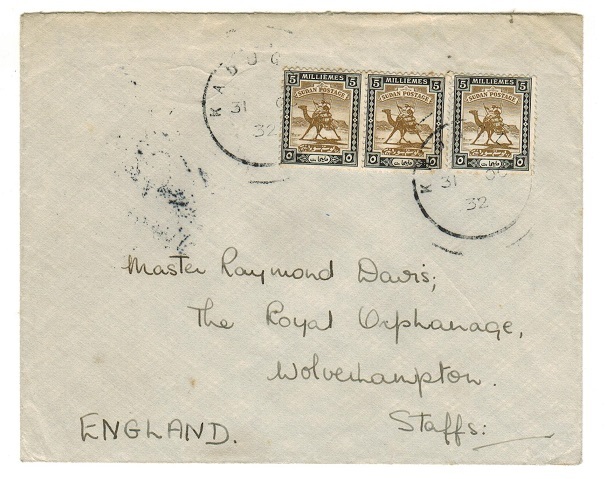 1948 (OCT.1) first day use of the 2p (SG112) adhesive on illustrated 'Sudan Stamp Jubilee' cover reg'd locally & cancelled by scarce violet POSTAL AGENCY/WAD EL NAU cds. 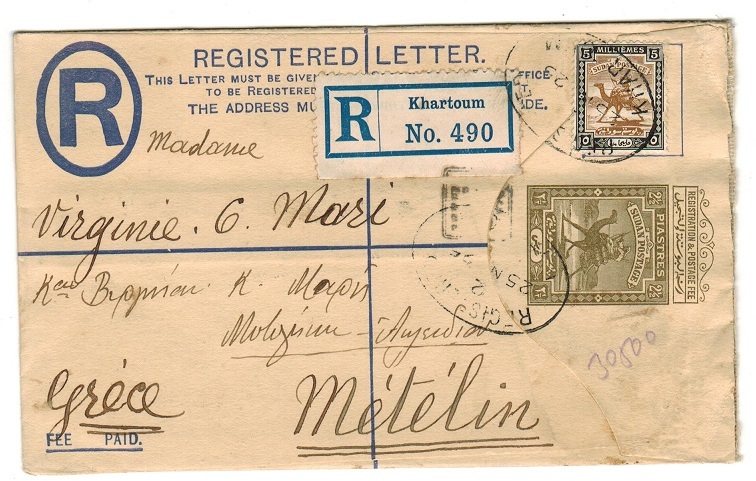 SUDAN - 1948 registered POSTAL AGENCY/MELLIT cover. 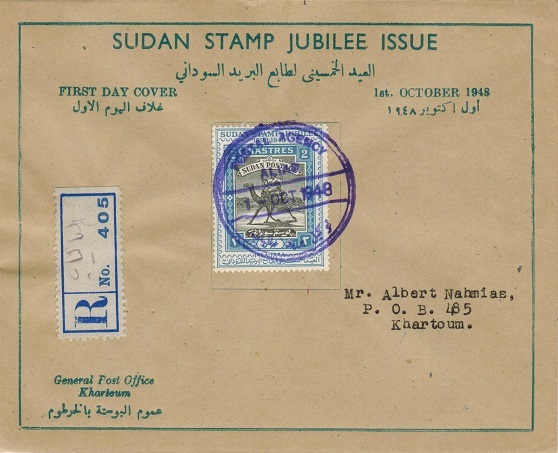 1948 (OCT.1) first day use of the 2p (SG112) adhesive on illustrated `Sudan Stamp Jubilee' cover reg'd locally & cancelled by scarce violet POSTAL AGENCY/MELLIT cds. 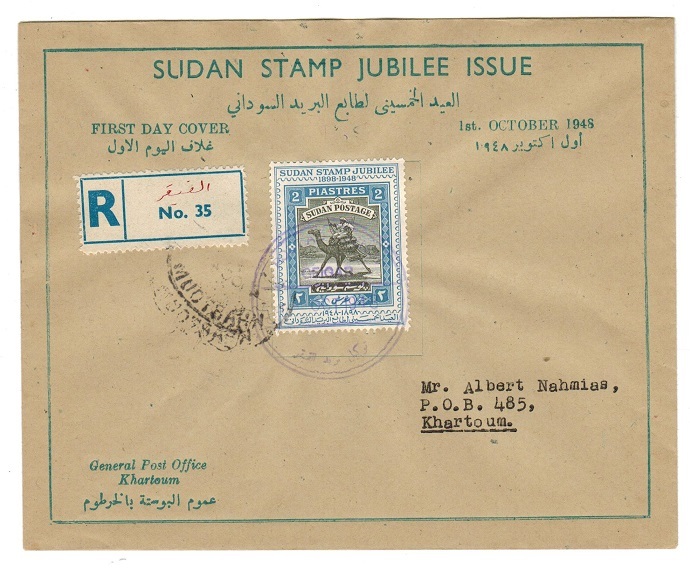 SUDAN - 1948 registered POSTAL AGENCY/ABBASIA cover. 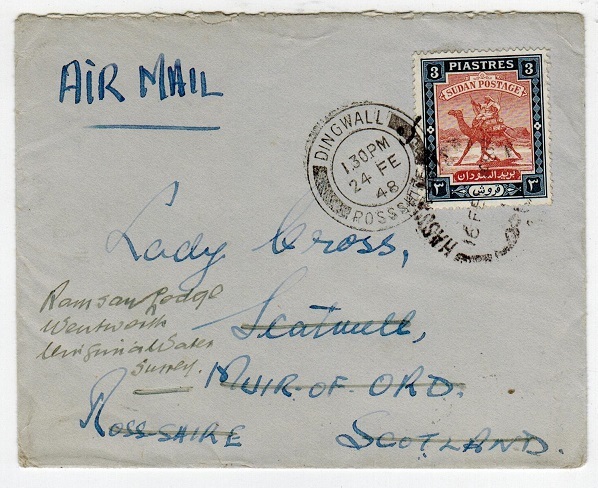 1948 (OCT.1) first day use of the 2p (SG112) adhesive on illustrated 'Sudan Stamp Jubilee' cover registered locally & cancelled by scarce violet POSTAL AGENCY/ABBASIA cds. 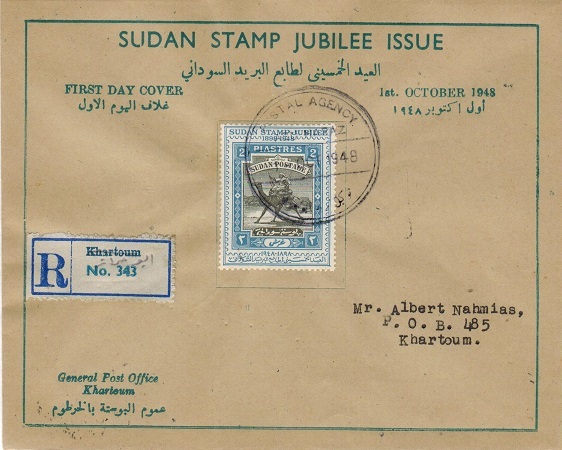 SUDAN - 1948 registered POSTAL AGENCY/ABU GUTA cover. 1948 (OCT.1) first day use of the 2p (SG112) adhesive on illustrated 'Sudan Stamp Jubilee' cover registered locally & cancelled by scarce violet POSTAL AGENCY/ABU GUTA cds. 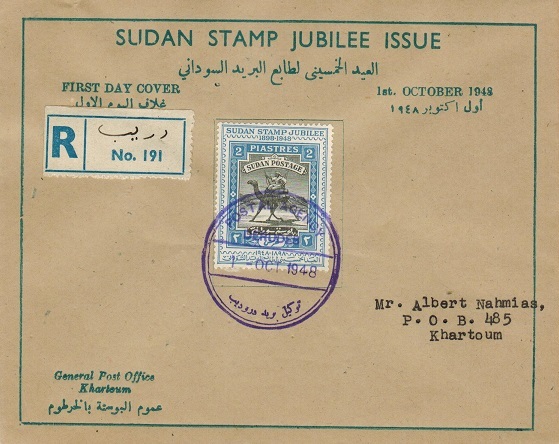 SUDAN - 1948 registered POSTAL AGENCY/ABU HARAZ cover. 1948 (OCT.1) first day use of the 2p (SG112) adhesive on illustrated 'Sudan Stamp Jubilee' cover registered locally & cancelled by scarce violet POSTAL AGENCY/ABU HARAZ cds. 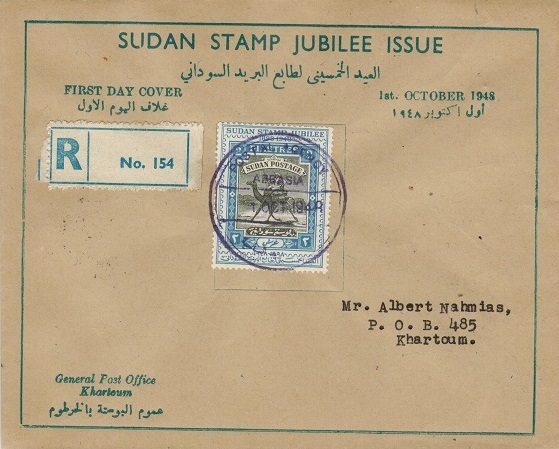 SUDAN - 1948 registered POSTAL AGENCY/ALIAB cover. 1948 (OCT.1) first day use of the 2p (SG112) adhesive on illustrated 'Sudan Stamp Jubilee' cover registered locally & cancelled by scarce violet POSTAL AGENCY/ALIAB cds. SUDAN - 1948 registered POSTAL AGENCY/AMADI cover. 1948 (OCT.1) first day use of the 2p (SG112) adhesive on illustrated 'Sudan Stamp Jubilee' cover registered locally & cancelled by scarce violet POSTAL AGENCY/AMADI cds. SUDAN - 1948 registered POSTAL AGENCY/UMM GERR cover. 1948 (OCT.1) first day use of the 2p (SG112) adhesive on illustrated 'Sudan Stamp Jubilee' cover registered locally & cancelled by scarce violet POSTAL AGENCY/UMM GERR cds. 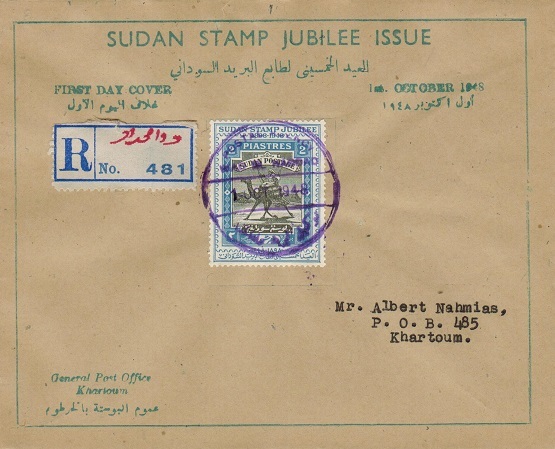 SUDAN - 1948 registered POSTAL AGENCY/DEGHEIM cover. 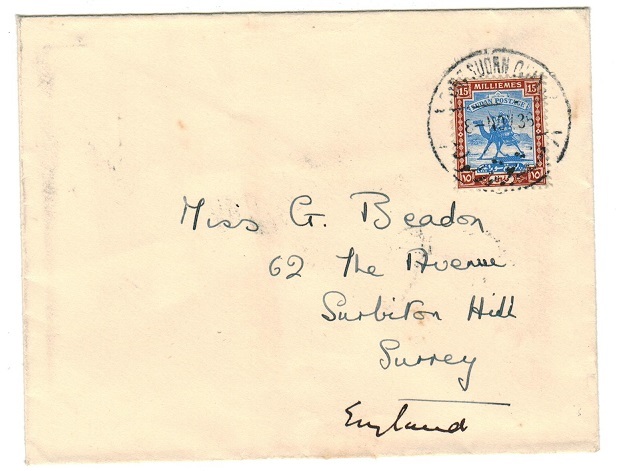 1948 (OCT.1) first day use of the 2p (SG112) adhesive on illustrated 'Sudan Stamp Jubilee' cover registered locally & cancelled by scarce violet POSTAL AGENCY/DEGHEIM cds. SUDAN - 1948 registered POSTAL AGENCY/DERUDEB cover. 1948 (OCT.1) first day use of the 2p (SG112) adhesive on illustrated 'Sudan Stamp Jubilee' cover registered locally & cancelled by scarce violet POSTAL AGENCY/DERUDEB' cds. 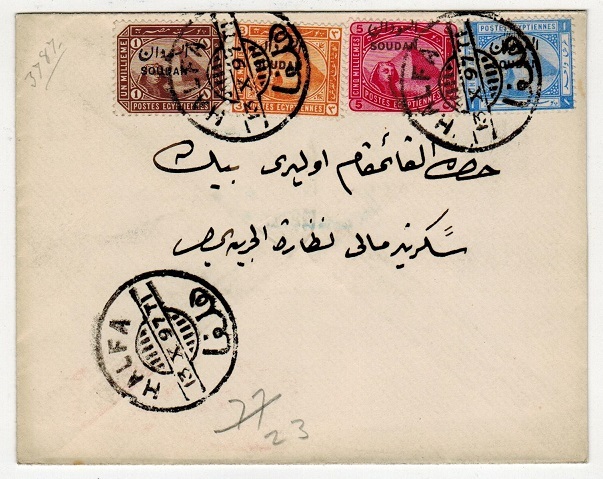 SUDAN - 1948 registered POSTAL AGENCY/WAD EL HADDAD cover. 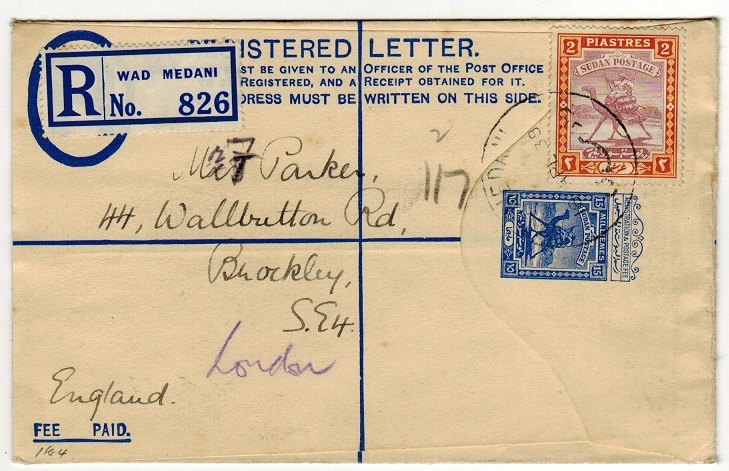 1948 (OCT.1) first day use of the 2p (SG112) adhesive on illustrated 'Sudan Stamp Jubilee' cover registered locally & cancelled by scarce violet POSTAL AGENCY/WAD EL HADDAD cds. 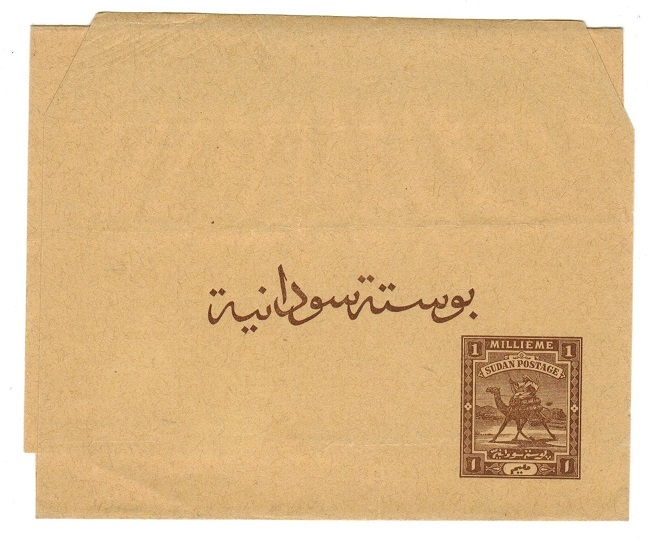 SUDAN - 1948 registered POSTAL AGENCY/EL MIEILIQ cover. 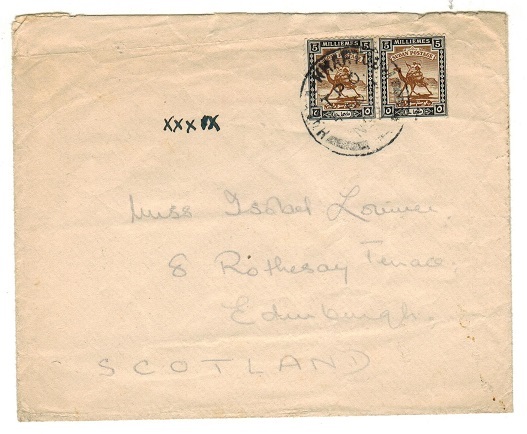 1948 (OCT.1) first day use of the 2p (SG112) adhesive on illustrated 'Sudan Stamp Jubilee' cover registered locally & cancelled by scarce violet POSTAL AGENCY/EL MIEILIQ cds. 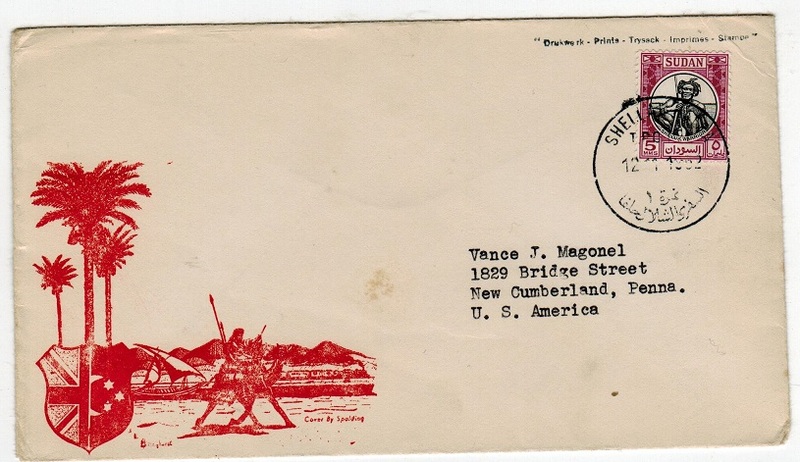 SUDAN - 1945 U.S.ARMY POSTAL SERVICE/APO 608 cover used by US troops stationed at Khartoum. 1945(MAR.15.) 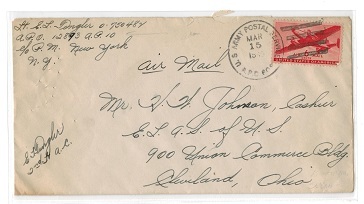 cover addressed to USA bearing US 6c air mail adhesive tied by U.S.ARMY POSTAL SERVICE/A.P.O. 608 cancel used at Khartoum. Sudan concessionary airmail rate for US troops stationed in Sudan. SUDAN - 1897 1p ultramarine sheet of 60 cto'd WADI HALFA with varieties and settings. SG 6. 1897 1p Ultramarine in a corner marginal gutter pane of sixty. (Some minor faults & reinforced separated perforation). The pane has been cto'd by WADI HALFA cds's dated 30.SE.97 & the multiple from the first setting shows the DAMAGED S (Row 1/6) & BENT ALIF (Row 3/5) varieties. A very scarce multiple with the six different type settings. SG 6. SUDAN - 1916 registered PASSED BY CENSOR 11 cover to UK from NAHUD. 1916 (NOV.4.) registered cover addressed to UK (Hinchcliffe Bros) bearing 1m,2m,3m,4m and 2p adhesives tied by NAHUD cds. 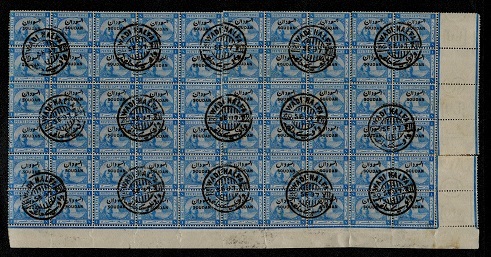 Blue on white R/NAHUD/No reg label at left and violet triangular PASSED/BY/ CENSOR/11/SUDAN h/s applied. Few edge bends but a nice censor usage. SUDAN - 1940 PASSED BY CENSOR 6 2pi rate cover to USA with green censorship label. 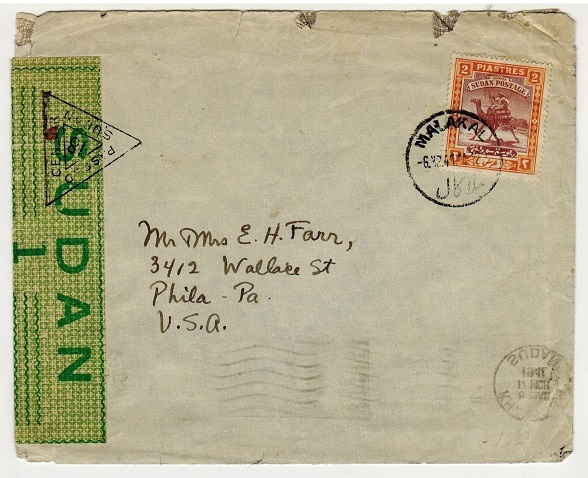 1940 cover to USA bearing 2pi adhesive tied b light ATBARA cds with green on white SUAN/6/CENSORSHIP label at left tied by triangular PASSED CENSOR/6/SUDAN h/s. SHELLAL-HALFA TPO 2 transit b/s. SUDAN - 1948 'GPO-Khartoum' illustrated FDC. 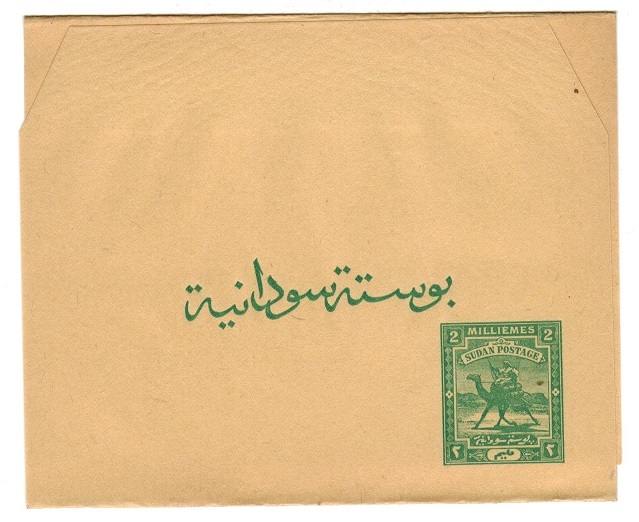 1948 (JAN.1) large official 'GPO-Khartoum' illustrated `New Arabic Issue Camel Design Stamps' first day cover addressed locally bearing the complete 1948 series (SG 96-111) tied by KHARMTOUM s/r cds's. Some edge crumpling but scarce. SUDAN - 1961 'Anglo-African 1st Trans World Safari' cover to UK. 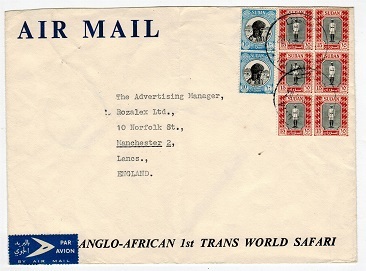 1961 (Ap.20) pre-printed ANGLO-AFRICAN 1st TRANS WORLD SAFARI cover to UK UK bearing 15mils (x6) and 10mils (x2) adhesives tied WADI HALFA. (centre fold). 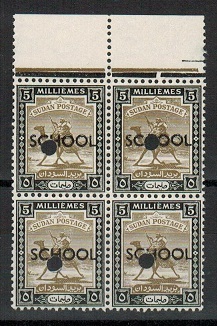 SUDAN - 1948 1m U/M block of four overprinted SCHOOL. 1948 1m Black and orange in a fine unmounted mint top marginal block of four each officially holed and each overprinted SCHOOL in black. SG 96. 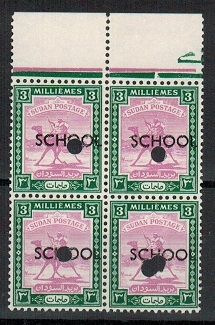 SUDAN - 1948 2m U/M block of four overprinted SCHOOL. 1948 2m orange and chocolate adhesive in a fine unmounted top marginal block of four each officially holed and each overprinted SCHOOL in black. SG 97. 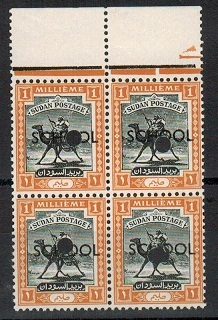 SUDAN - 1948 3m U/M block of four overprinted SCHOOL. 1948 3m mauve and green in a fine unmounted mint top marginal block of four each officially holed and each overprinted SCHOOL in black. SG 98. SUDAN - 1948 4m U/M block of four overprinted SCHOOL. 1948 4m deep green and chocolate adhesive in a fine unmounted top marginal block of four each officially holed and each overprinted SCHOOL in black. SG 99. 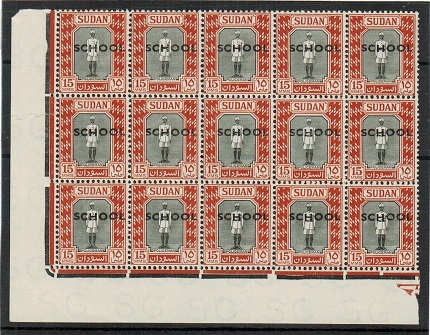 SUDAN - 1948 5m U/M block of four overprinted SCHOOL. 1948 5m olive-brown and black in a fine unmounted mint top marginal block of four each officially holed and each overprinted SCHOOL in black. SG 100. 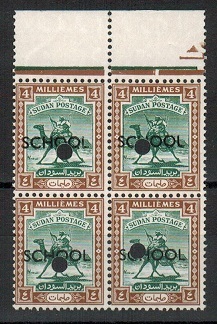 SUDAN - 1948 10m U/M block of four overprinted SCHOOL. 1948 10m rose-red and black adhesive in a fine unmounted top marginal block of four each officially holed and each overprinted SCHOOL in black. SG 101. SUDAN - 1951 5m IMPERFORATE PROOF pair with VIGNETTE DOUBLE, ONE INVERTED. 1951 5m 'Shilluk Warrior' issue (SG 127) in a fine bottom marginal IMPERFORATE PLATE PROOF printed in the issued colours of black and purple on pink paper showing the variety VIGNETTE PRINTED DOUBLE, ONE INVERTED. A scarce variation. Ex printers proof waste. 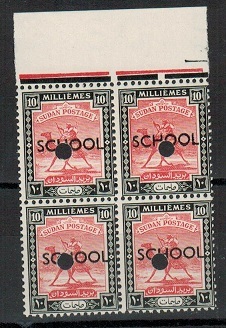 SUDAN - 1951 15m 'Policeman' adhesive in a mint block of 15 overprinted SCHOOL. 1951 15m 'Policeman' adhesive (SG 129) in a fine unmounted mint corner marginal block of 15 (5x3) overprinted SCHOOL. 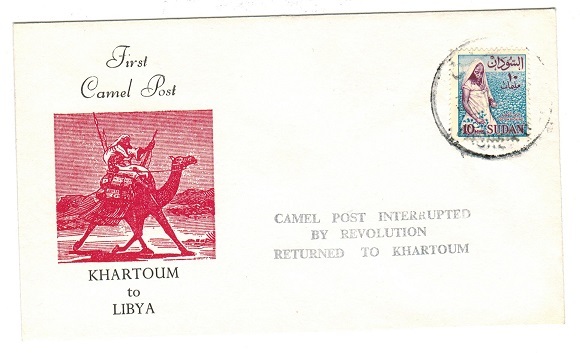 SUDAN - 1980 CAMEL POST INTERRUPTED BY REVOLUTION cover. 1980 (circa) illustrated 'First Camel Post/Khartoum to Libya' cover bearing 10m adhesive and cancelled by somewhat unclear FASHER cancel. These covers were prepared but never used and and each handstamped in black by three lined CAMEL POST INTERRUPTED/BY REVOLUTION/ RETUNRED TO KHARTOUM h/s. SUDAN - 1950/60's £1 black and pink unused SUDAN POSTAL ORDER. 1950 circa £1 black and pink on cream SUDAN POSTAL ORDER in fine unused condition complete counter foil. SUDAN - 1950/60's 500mils black and pink unused SUDAN POSTAL ORDER. 1950/60's circa 500 mils black and pink on cream SUDAN POSTAL ORDER in fine unused condition complete counter foil. SUDAN - 1910 (circa) FOURNIER forgery of the OSGS and SUDAN overprints. 1910 (circa) FOURNIER forgery proof strikes of the O.S.G.S. and SOUDAN (2 types) overprints printed in dark blue on cream card cut from the handbook. SUDAN - 1902 1m COLOUR TRIAL in violet and blue handstamped SPECIMEN. (Fault). 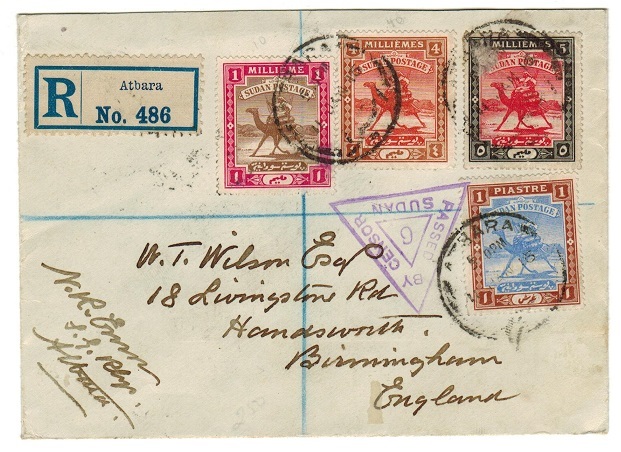 1902-21 1m COLOUR TRIAL (SG type 2) printed in the unissued colours of violet and blue on ungummed, unwatermarked paper and handstamped SPECIMEN at bottom (Samuel type DS2). Small tear at top.